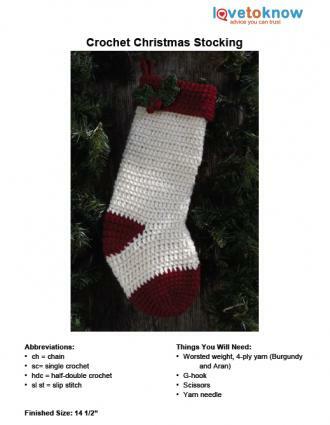 Make all the members of your family new Christmas stockings this year using this simple crochet stocking pattern. Its cute toe and heel patches give it vintage appeal. This Christmas crochet project is suitable for a beginner. All elements of this stocking are attached as you go. It is worked in the round, and there are no seams to sew. Click on the PDF pattern to download and print. Try these helpful tips if you have trouble downloading the pattern to your computer. For individual variety, transpose the two colors used in this pattern or introduce two different colors. Make larger or smaller stockings without altering the pattern. Use bulky yarns and large hooks or thin yarns and small hooks, respectively. Looking for something a bit more funky? Give the stocking at Zooty Owl a try. The beautiful motifs and the granny stitch cuff may seem more vintage than artistic, but the colors the designer used create a Southwestern charm. This pattern is suitable for a crocheter with intermediate skills. The miniature jingle bell stockings found at Red Heart would be perfect for slipping gift cards in and hanging on the tree as ornaments. This is an easy project that is perfect for a beginner. Let's face it, who wouldn't want a Minion stocking hanging from their mantel? Loopsan has an easy crochet pattern with vibrant colors that make this stocking come to life. With the many celebrations happening during the holidays, crochet a few extra stockings to package candy or wine for hostess gifts. The gift bag stocking then becomes a reusable gift all on its own.